When I took this picture some months ago, last summer I think, and I was about to publish it here I suddenly found out that someone else had posted a very similar shot, from the same place. I thought the scene wasn't original enough to show. Things like that happen in public places, you are not the only one around shooting for the web. But now I think, hey, this is my picture, so what the heck, the fact someone posted it first doesn't make me a cheater. 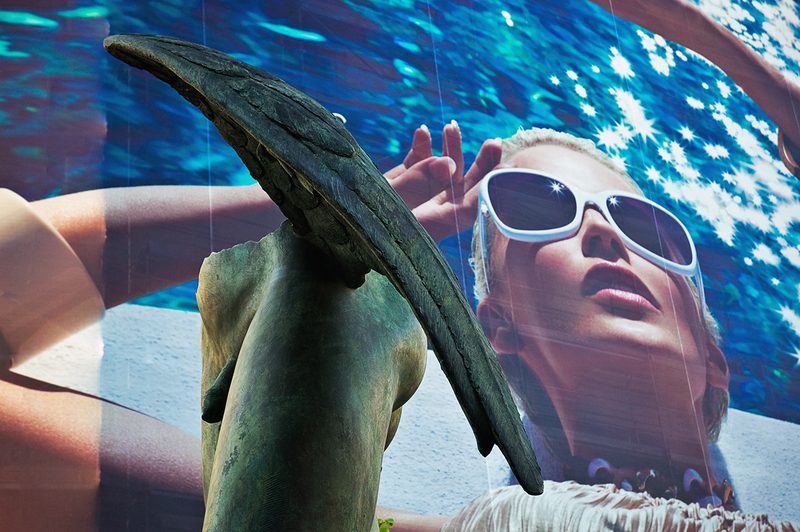 So here it is, back from my archives, a detail of one of Igor Mitoraj's itinerant sculptures against a very idyllic billboard at Rambla Catalunya. By the way, the lady, the pose, the golden reflections remind me of (now you will think I went crazy, hmm, more or less) that famous The Graduate scene where Dustin Hoffman is laying back on a beach mattress in the middle of the swimming pool with a hand behind his neck and wearing sunglasses. Need a little help? : The Sounds of Silence. I reckon the comparison is a little ackward, but you know how weird daydreaming can get to be sometimes. How about adding some common sense to the photograph by recalling other Mitoraj sculptures featured in Barcelona Photoblog in the past: A Closer Look on Igor Mitoraj's Sculpture , Grande Toscano, Mysterious Faces, Lying Head and Hold Me Tight. Molt bona toma i una gran exposició urbana. Hola Jordi, em recordava que la vaig veure a algún lloc. Probablement va ser aquesta. M'agrada que posis l'enllaç. Al final l'angle es diferent. Molt millor. Es un altre punt de vista. Moltes gràcies. Hello Jordi, I remember I had it seen it somewhere. Probably the same picture. I am glad you drop the link here. The angle turned out to be different in the end. Much better. Another point of view in fact. Thanks. Greetings.